Skyline Art is committed to developing both innovative and inspirational art programs for healthcare facilities. 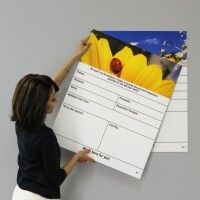 Our dedication to improve the patient experience has led us to develop our signature line of patient-care markerboards. We developed this product line to organize the patient room footwall and to eliminate unsightly spaces by integrating a va­riety of functions into a single product. Though our boards can be used in many different settings, a well-designed patient-care markerboard can facilitate the collection of data for the HCAHPS (Hospital Consumer Assessment of Healthcare Providers and Systems). Our markerboards are made to order, and use the most durable and highest quality materials. They allow for flexibility in configuration, dimension, finish specifications, and artwork selections. Because their components are interchangeable, you can build solutions that are simple or elaborate.